The London Mayor has the opportunity to support an innovative and sustainable food economy. Food production and fair, transparent access to land need to be at the centre of the vision for London. We encourage the GLA and local authorities to extend their support to the urban agriculture sector by responding to vital needs for long-term access to land and resources. We are the Community Food Growers Network- a democratic organisation of food projects that spans across London including youth groups, community kitchens and organic market gardens. We are passionate about creating a sustainable, just and empowering food system. 1. Each London local authority to identify, support and protect land that is available (and already used) for community gardening, food production enterprises, allotments and orchards. Boroughs should make information about this land publicly available, and help organisations and individuals to access the land in order to use it for food production. 2. London local authorities and the GLA to offer long term leases for food production sites, that reflect the lifelong investments needed to make it possible to produce food and build soil fertility, contributing to the local economy and environment for the benefit of all. 3. All new housing developments incorporate food growing spaces through architectural and landscaping methods such as green roofs and community orchards. 4. The London Mayor promote and strengthen the London Food Strategy, working in partnership with representatives from local food businesses and the community food growing sector through the London Food Board. 5. 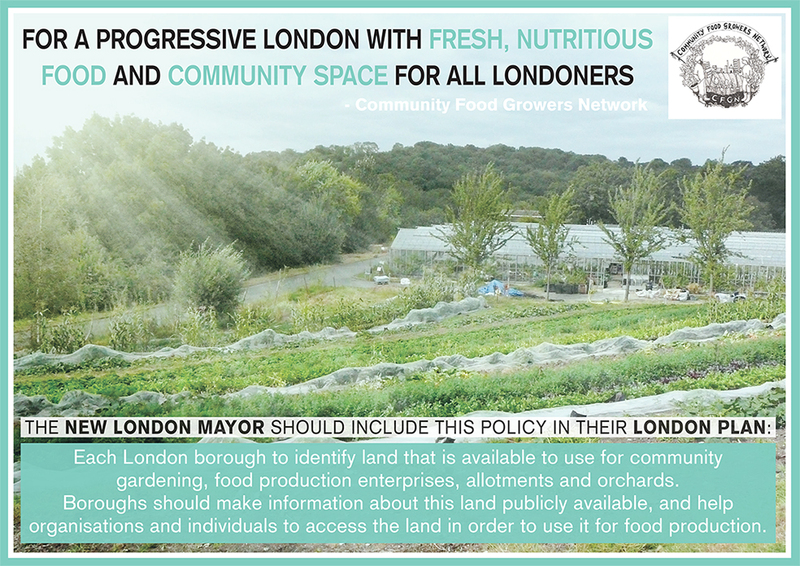 The GLA and local authorities work towards a vision of a Greater London with a thriving local food economy, prioritising the establishment of sustainable agricultural businesses and farm-to-table housing communities (1) in the greenbelt, as supported by current government policy and legislation. We want a London where all Londoners have access to fresh nutritious food, community space, and opportunities for meaningful employment. (1) The development of community led farm to table housing communities, that are low to medium density, sustainable built, and truly affordable. These will meet the needs of agricultural workers, woodland stewards and others involved in production, marketing and distribution of food in and around farms and market gardens in metropolitan, open and green belt land.